A few months back, I had the good fortune to sit across from Hedvig Alexander, founder of Far & Wide Collective, at a dinner hosted by Anthropologie. For seven years, Hedvig worked in Afghanistan in international development. During her time there, she worked with local artisans and crafts people and she saw time and again how they were unable to connect with buyers worldwide who were increasingly wanting and demanding authentic, handmade products in their homes. Sensing a hole in the marketplace, Hedvig created Far & Wide Collective as a way to support individual craft producers through trade. The business model is quite simple. Artisans create beautiful, unique products and Far & Wide takes care of getting the items to markets worldwide. The final step in this sustainable system is getting shoppers like you to purchase the product. Over the course of our dinner, it became obvious to me that I had the means to help with this final crucial step. Honestly, it was a no-brainer. These are the kind of products I want in my home. Each has a direct link back to the hands of the people that made them - each is tied to a face, name and family you are supporting by purchasing these products. This became so evident to me when we were shooting some of the baskets made by the Kasigau weavers out of Kenya. Sewn into the bottom of each basket is a scrap of cardboard signed in ink by the weaver who made it. It doesn't get much more personal. Together with photographer Sian Richards, I spent a day shooting some of the pieces in both of our homes. Today I'm happy to show you the first of those images and tell you a little bit more about the artisans who made them. White beaded cuff and Porcupine Naibor earrings - this jewellery is made by Sidai Designs, a non-profit organization that works with Masaai women in Northern Tanzania. Walnut Kabul Jali Trivet - made by master craftsman, Masoud Abdul Baqi in Afghanistan, this trivet replicates the looks of privacy screens found instead of windows in the old houses of that country. Mini charcoal and gold pulp bowls - old magazines are turned into pulp and then moulded into new shapes to create these multi-functional bowls. They are made by Quazi Design a cooperative out of Swaziland, which has been in business since 2009. Black round placemat - made in Swaziland by Gone Rural, a socially responsible business that works with over 750 rural women. The mat is woven from a naturally durable grass known as lutindzi. It is harvested in January and pulled from the sheath leaving the roots intact to ensure replenishment for the next year. White-stitched charcoal bowl - Similar to the mini charcoal and gold pulp bowls pictured above (and featured again here) it is made from old magazines that are turned into pulp by Quazi Design. A white thread is stitched around the bowl in a loose stripe to create graphic interest. Bloc-stripe hand towels - these are made by Kara Weaves, which partners with local weaving cooperatives throughout Kerala, India. The towels are sold as a set of two and come in a range of colours. Round floor mat - is made in Swaziland by Gone Rural. The rug is woven from a naturally durable grass called lutindzi. The centre bullseye is dyed using certified organic natural dyes. available in 15 different colours. Wave basket - These skillfully crafted one-of-a-kind baskets are handwoven by men and women in The Baba Tree collective in the town of Bolgatanga, West Ghana. Choosing, splitting and rolling the straw for one wave basket takes one entire day. It takes another day to dye the straw and four to five days to actually weave the basket. Blue Otomi Blanket and Yellow Otomi Pillow - This hand-embroidered blanket and pillow is made by Cooperativa Doni Joy, a group of female artisans in the Mexican state of Hidalgo. The graphic patterns represent floral and animal shapes which are said to be inspired by drawings in nearby caves. 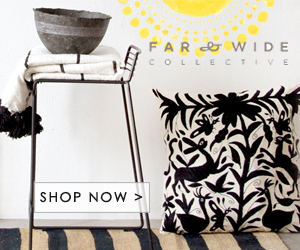 Hop on over to Far & Wide Collective to see more of their beautiful products.